Human society has so many rules. If you try bending a single one even a little bit, people accuse you of being raised by wolves! Well, maybe that's not so bad. After all, wolves are rather cute and they're covered in fluffy fur that must keep them warm during the colder months. They never have to worry about their cold paws touching the kitchen floor in the middle of the night! Maybe it's time to start living a little more like a wolf... starting with your feet. 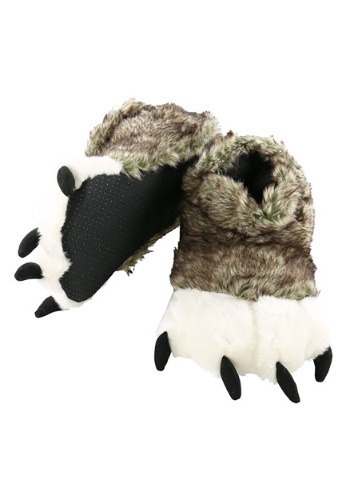 These Wolf Paw Slippers turns your feet into warm, fuzzy wolf paws! They're made out of an ultra-soft polyblend material and features a thick layer of faux fur on the exterior. That means that help keep your feet cozy all evening long! They even have no-slip grips to help you navigate those sheen kitchen floors. Upkeep is easy—you can wash them in warm water and tumble dry! The size chart mislead me big time (I wear a women's 8.5/9 and went with the XL), and these are massive. I'm guessing the size chart is in men's shoe sizes. The slippers do look nice, and so far have held up well. The slipper/foot space is open all the way to the end of the 'wolf toes'. The bottoms are soft fabric with the little non-slip dots, so definitely indoor-only slippers. They are super long, but I'm happy with them.